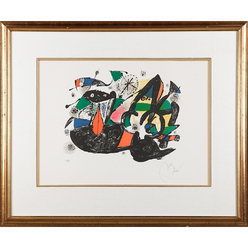 Miro, Joan; Lithograph, signed, Untitled, Abstract, 22 inch. 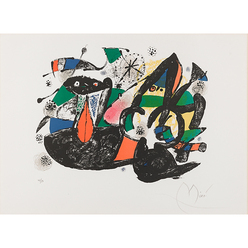 Joan Miro, Untitled, lithograph in colors, signed and numbered 43/50; image credit on full record. Joan Miro (Spanish, 1893 to 1983), Untitled, lithograph in colors (framed), signed and numbered 43/50. 16 1/4" x 22 1/4" (sight).